Is there a video which explains how it works? Our items are digital files (PDF format) that you could download as soon as your purchase will be confirmed. One of the PDF files is the instructions (it doesn’t need to be print - if you want to, you can print it on a normal office paper). This document explains step-by-step how to assemble your sculpture. The other file is the pattern to be print on a thick paper (using A4 / A3 - Letter / Tabloid in the US). The pictures of each item show the sculpture once finished. Will I be able to do it myself? It seems hard to assemble. Of course, everybody can make it. You will just need the right utensils to do it but more important, you will need time, motivation & patience. It is a fiddly job but it is entertaining. You can use it to relax with music as the process of cutting, gluing and folding will soon become automatisms. If your child is under 12, I advise to make it with him/her. We don’t recommend letting a child under 12 to do it by him/herself. 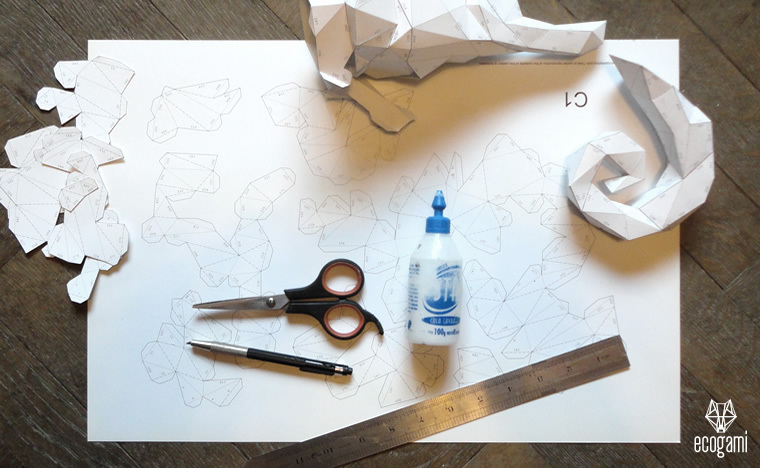 If you have never done a paper craft sculpture before, it hasn’t to stop you. Just follow the instructions & you will soon realize that it isn't so difficult than what it seems. What are the tools I will need to make it? Are there any special recommendations? A pair of scissors to cut each piece of the pattern. A scoring tool to mark/score & fold the pieces (it could be a ball point pen without ink, a small cutter or even better a paper scalpel like X-acto). A ruler (metal ruler is better). A nice working space to motivate you. One of the best recommendation we can give is to follow the order of the template. The small parts are harder to assemble because they have small folds so we recommend to begin with them. If the sculpture has a pointed part (like a horn for example), you must begin with the point (it is usually explained in the pattern). If the sculpture has a base or a neck, we recommend to finish with it. We recommend a paper of at least 200 GSM (Grams per square meter). To make the prototype of each one of our models, we use a paper of 270 gsm and it works perfectly for that kind of sculpture. It is stronger and it gives more strength to the final sculpture. You can print on a color paper (We don’t as we always paint the sculpture at the end). If you use a color paper, you will have to assemble the model with the numbers of the pattern inside the sculpture (Don't worry, it is all explained in the instructions which go with all of our models!). The format of paper/sheet is A3 or A4 - Tabloid or Letter in the USA (some of the sculptures can be printed in A3 or A4 format and it doesn't change the size of the final sculpture – some of the sculptures has to be printed in A3 or A4). To make the propotype, we go in a print house with a USB Pendrive, we buy the paper & print it there. What type of glue do I need? White semi-liquid paper glue works perfectly for those sculptures (It's sometimes called "Vinyl Glue"). It dries in few minutes. After gluing, you just have to press the two pieces of paper few seconds & that all! I want to buy one of the patterns to make a gift! Is it a good idea? You can offer the pattern as a digital file (& even send it by email if your friend or family member doesn't live near you). You can print the pattern & the instructions, put them in an attractive gift envelope & offer/send the envelope. Or even, you can assemble the sculpture yourself & offer the finished model. If I buy a template, how many sculptures could I make? Once the pattern bought, you will have it for you so you could make the sculpture any times you want. However, you can’t sell, share or publish the pattern or the final sculpture as it is prohibited. Your purchase should be only for you. Our creations are protected by Copyright. Is there a customer service if I have questions? Can I contact Ecogami? Yes, before or after your purchase, you can contact us by clicking on CONTACT in the main menu. EcogamiShop Affiliate Program is free, and, it will allow you to earn money easily through an internet link. Once your affiliate account will be created, you will get a specific link with a unique URL code. You can distribute this link via your Facebook page, your Instagram account, your website, your blog or by sending it by email. All sales made by customers who click on this link will generate you an affiliate commission. The commission rate is 30%. After each sale generated by your link, you will receive an email informing you that you have received a new commission. You will be able to check at any time the amount available in your affiliate account and ask for a payment as soon as this amount will reach a minimum of 15 Euros. The affiliate commission is paid via PayPal or via bank transfer if you have a bank account in Europe. Are you ready to start generating sales and extra incomes? Register first as an affiliate and do not hesitate to spread your link as much as possible. If you have any questions, do not hesitate to send me a message.